Aspiring millionaire: Does being a millionaire mean anything these days? Does being a millionaire mean anything these days? 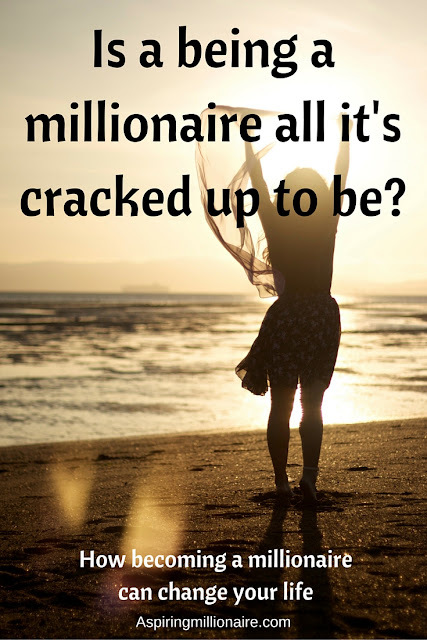 Do you think being a millionaire is really all it's cracked up to be now? For me, while I had the goal to be a millionaire by 30, the real goal was financial freedom. Becoming a millionaire was the clear cut, definite amount I wanted. I wanted to have $1,000,000 worth of cash and assets. How does it benefit you or change your life? Since starting this blog I have connected with many millionaires, entrepreneurs and highly successful people. It's been interesting listening to their thoughts on the process and how it changes your life. Some were self made millionaires, others born into. The differences were interesting. They all travel more. Some because they can afford it, other because they created businesses or jobs that incorporate travel. Travel is a passion and priority of mine. I love having both the financial freedom and the work opportunities which allow me to travel. They give more and do more. Charity has always been part of my life. I grew up a member of The Church of Jesus Christ of Latter Day Saints. I gave away 10% of my income to the church and was actively involved in helping others from a young age - gardening for those who couldn't, babysitting for single mums, cleaning etc. I love helping others and often thrived on being able to do things to help. As your income grows, so does your capacity to give. Charities need money to run. They need people helping to raise awareness, holding functions, arranging donations and volunteering. I selected my causes - homelessness and domestic violence, and set out to do what I could in those areas. Being financially stable enabled me to have more time to help along with connect with people who could contribute on a greater level. With more money, you do less yourself. Outsourcing what you can to buy yourself time is one of the best things about increasing your income. Having the capacity to hire professionals or have other people do things while you spend your time on things you enjoy or things that will make you more money is a luxury not everyone can afford. You cannot buy your health. If you have better income, you can afford better health care. For example, I know many who cannot afford to go to the dentist, need medical treatment they have to put off because they cannot afford it or they don't have the time to workout and take care of themselves. Their lifestyle and diet both leave a lot to be desired. Unhealthy foods are often cheap so that is what is bought. Health should be a priority. With more money you can afford medical treatment, regular dental check ups, preventative health options such as massage, naturopathy, gym memberships (if desired. You can work out for free in other ways). Your stress levels often reduce when you are financially stable too. Being a self made millionaire doesn't mean you can buy the flashiest car or go out every night. There is still the misconception that millionaire status equates to a flash lifestyle. If you are a millionaire, you won't stay one for long if you try to live a lifestyle like the 'rich and famous'. Most keep quiet about their millionaire status and live as they always did. They had more freedom though. Is being a millionaire that different to 'regular' life? From what I have seen, yes and no. Millionaire status isn't what most assume it is with flashy cars, expensive clothes, luxury holidays etc. However, it does provide a better sense of security, reduces stress, provides more options and lets you have a comfortable lifestyle. I think it is a great goal to aim for, if you are aiming at creating income producing assets and working on financial freedom. If your goal is purely to be a millionaire to spend like Kim or Kayne, you will be disappointed.